Atlas Copco’s Size 1 portable compressors are specially designed for heavy-duty, harsh environments.They are totally at home in the renovation industry and quarries, are ideal for sandblasting applications, and operate reliably at high altitudes and extremes of temperature. Powered by an ultra-efficient 4-cylinder Deutz engine, Size 1 compressors give you a reliable source of compressed air for your applications, or for combinations of your pneumatic tools such as rock drills and hammers. All models meet the latest exhaust emission and noise directive criteria. Built to last – Their robust construction can withstand rough treatment over a long lifetime of operation in the harshest of work environments. Zincor™ steel canopies offer high resistance to corrosion. Low operating costs – The highly efficient screw element is paired with either a COM 2 (C2) or COM 3 (C3) compliant Deutz diesel engine, to give you low operating costs and high resale value. 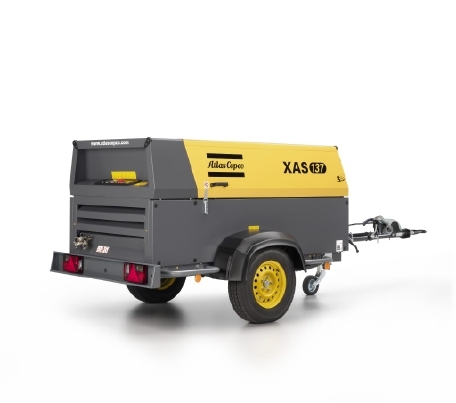 Highly transportable – Your operators will appreciate the small dimensions and light weight of Size 1 compressors, as they can easily maneuver the machines from one location to another. Easy access for fast service – The gull-wing door concept enclosure provides exceptional access to all the service points, accelerating maintenance and reducing downtime.